Welcome to the tail end of 2015 and beginning of 2016. I know this is a little overdue but better late than never. I still can't quite believe 2015 has been and gone. At first I couldn't really think of anything particularly momentous when I looked back at the year just passed but given time I realised it was a pretty good one. I hope 2016 is just as good if not better. I hope it's off to a great start for everyone. Anyway, this post covers from Sunday 27th of December 2015 to Saturday 2nd of January 2015. Enjoy! Sunday was a busy day. We got up for breakfast and got ready to go shopping. I don't usually go shopping just after Christmas because it feels greedy and also sale crowds aren't my thing. However, I had a voucher to spend and Eva wanted to have a look too. We new we wouldn't be out long because our grandparents and my aunt Karen were coming for dinner as they always do the day after Boxing Day. We weren't out long. It was packed and I just wanted to get what I wanted and go home. My dad was going to drop us off and come back for us but we ended up finishing up before he even left as he had a look around too. I can't really remember what I bought other than another Sylvanian Families set that my voucher covered because it was in the sale. When I got home Eva and I set about opening it and setting it up. Can you tell what it is? It's a tree house! Because it was the gift set version there was there little sets inside that I almost missed. I mean it showed them on the box but I was disappointed when I thought I was mistaken that you got them with them. Luckily Eva noticed them and we had fun setting them up. I plan to do a post dedicated to this set in my Toys 'n' Stuff series in the future, so look out for that. 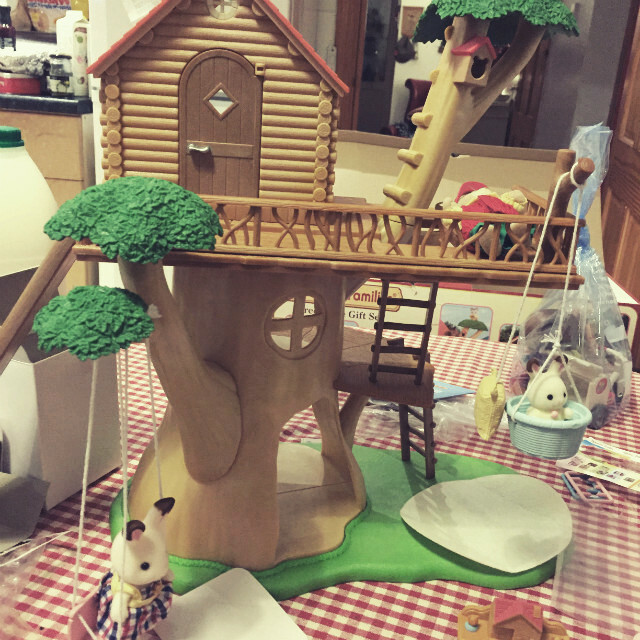 After chilling for a while, setting up the tree house and browsing online for the perfec Sylvanian Families family to purchase as there hadn't been many to choose from in store, my grandparents and my aunt arrived for dinner. Dinner went as well as could be expected with my granny's Alzheimer's. She enjoyed her food, as did my granda and my aunt Karen, but she was pretty confused as you can imagine. They didn't stay too long after dinner as they were both tired, so my aunt Karen took them home and picked up her dogs before coming back to play some games. We played Jenga and True Or False, which was a lot of fun. By the time my aunt Karen left I was pretty tired. I browsed online and watched some stuff then headed to bed. Monday was Eva's first day back at work after Christmas. Dad was still off so made me breakfast and got me up. While I ate breakfast I watched Storage Hunters UK with my dad. It was a pretty chill day. I procrastinated a good part of the day but eventually I got around to finishing My Week In Words and posted it up late in the day. You can check it out here if you missed it. After I got the post up I chilled and ate supper before heading to bed. Tuesday was a game day. Eva got me up and we ate breakfast together. She made me an omelet because I'm attemptng to try new foods and expand my diet. I didn't like the texture too much but it was a lot better once my dad made me some toast to go along with it. 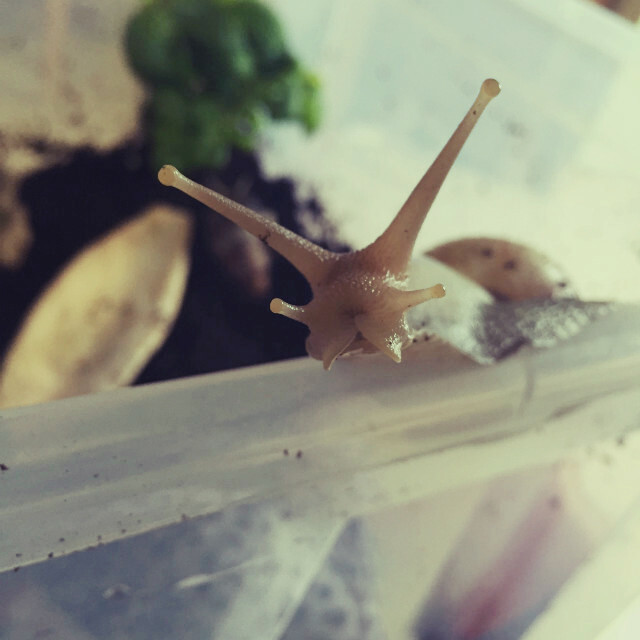 In the afternoon I cleaned out my snails and put in a new plant for them to munch on. Once the snails were done I set about getting ready and then headed for the train. It was a horrible night. I think we were having the tail end of a storm or something if I remember correctly. It was so wet and windy. I ended up soaked again. 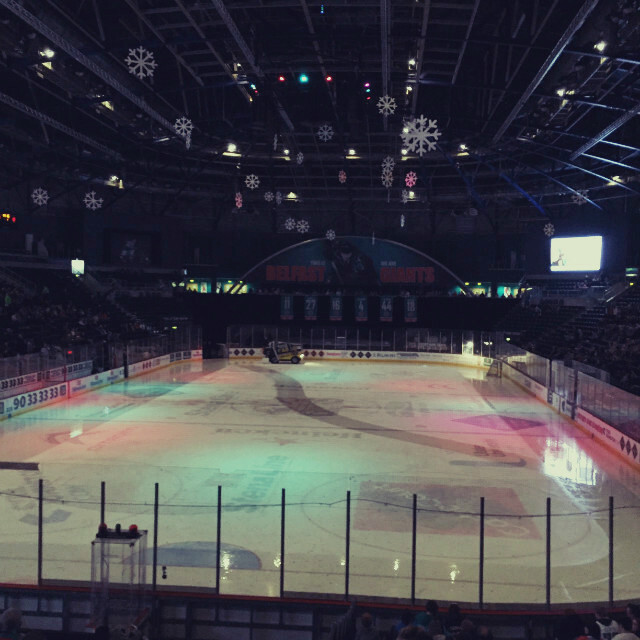 The Belfast Giants had a rubbish game against the Braehead Clan and we lost. I started to get chest pains at some point during the game. 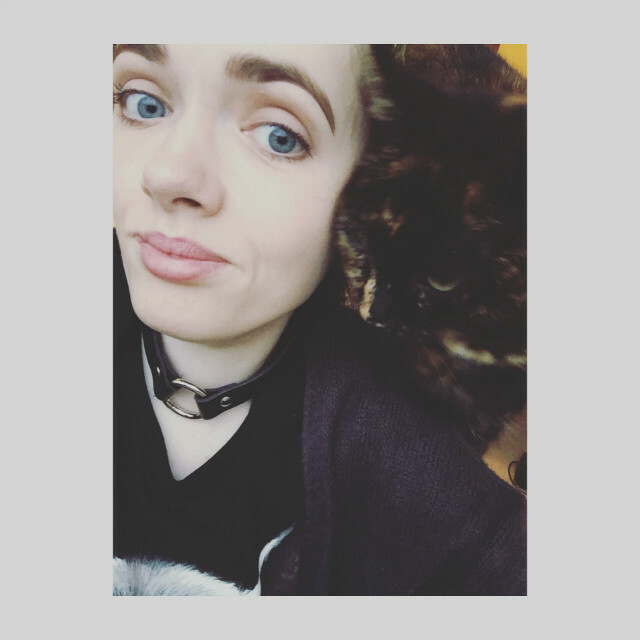 It was all round a bad time but I still managed to look happy in a selfie with Eva. On the way to the car I had to take a detour on to the main road because beside the curb had flooded a few inches and I couldn't go through it in my electric wheelchair. I decided after such a horrible night that I was going to skip the game the night after as the weather was just too bad. I text my aunt Karen when I got home to let her know and then had supper before heading to bed. Eva was working again on Wednesday and Dad got me out of bed and made my breakfast. We watched Storage Hunters UK together again and I have to say I may be a little addicted to that show. Anyone else watch it? 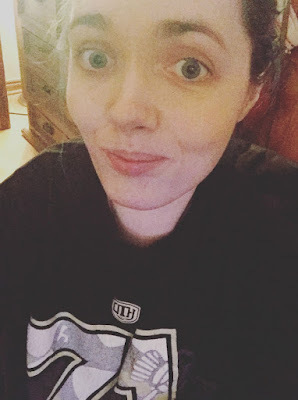 Anyway, I mooched about online for a good part of the day and as the day wore on the weather got better and I started to get anxious about the fact I wasn't going to the game. I regretted telling my aunt that I didn't want go go but when I text her to ask if she'd still be interested she'd made other plans. Thankfully my dad stepped up said he would take me. The game was a lot better than the night before and we even won! When I got home it wasn't long before I headed to bed after some supper. It had been a long couple of days. I had breakfast with Eva and Dad on Thursday and we watched more Storage Hunters UK together. 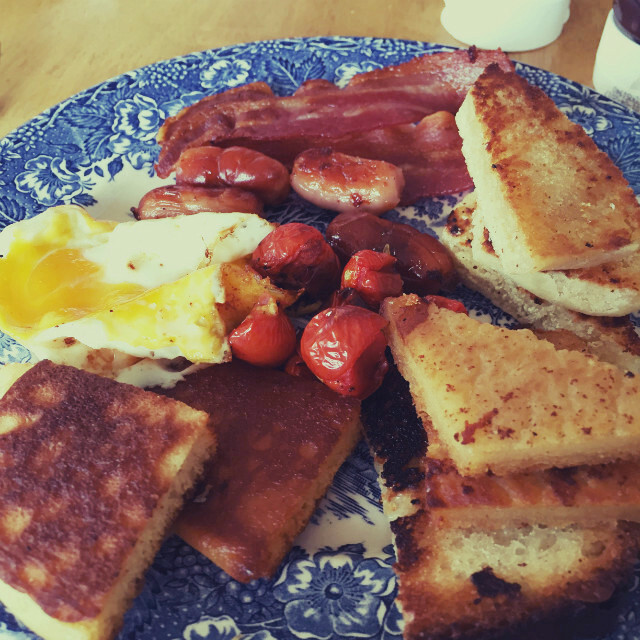 Dad made us our last fry up of 2015. Mum was at work and it was a pretty chill day. 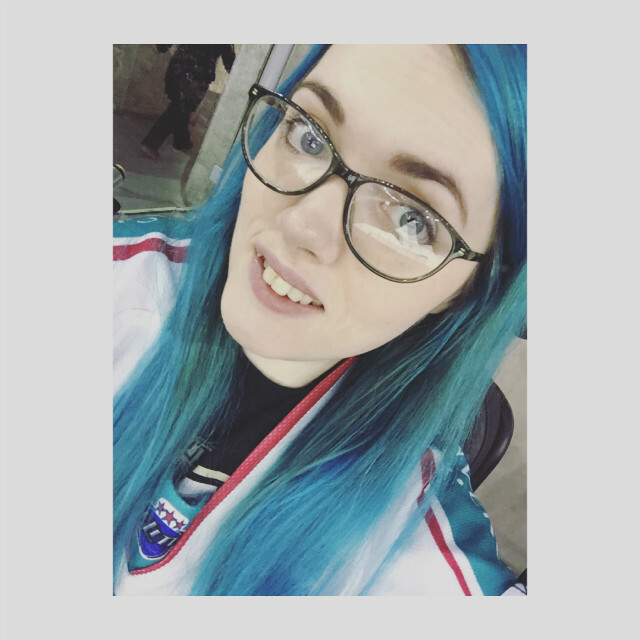 We had planned to go out for dinner in the evening like we did last year but none of us were that fussed and my mum has been having trouble with anxiety related choking so we thought it might be better for her if we didn't go. So we decided to stay in and get party food. I text my aunt Karen to see if she wanted to come round and chill with us and perhaps play some monopoly. I'd just sent the text when she appeared at our back door. She chatted with us for a while then decided she'd go and call in with my grandparents and get her dogs before she came back to play. While she was away I set about cleaning out Rue for the last time in 2015. 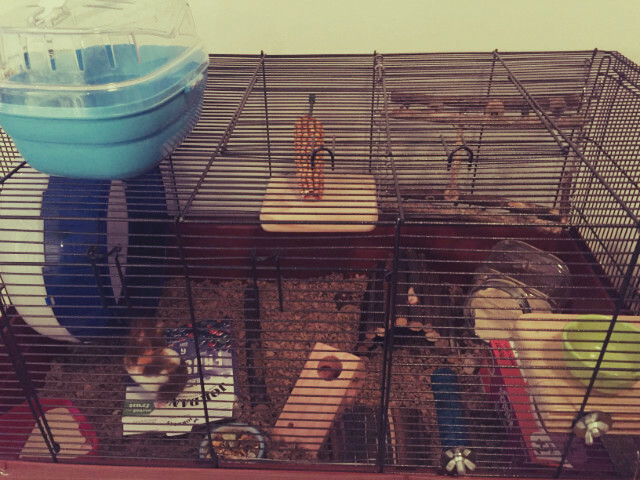 I also changed around her cage a little and put her sand bath back in. I think she missed it. My aunt Karen actually ended up helping me finish off cleaning Rue out as she arrived before I had finished. I had planned to get a shower so I would be nice and refreshed for ringing in the new year but I didn't end up having time to do that. 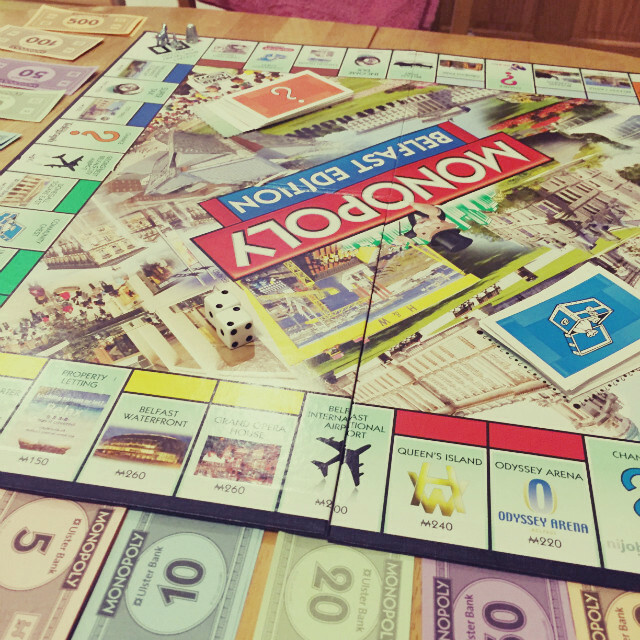 Once I'd finished Rue we set up the Monopoly board. I was so excited as we never make the time to play Monopoly. It was also the first time we were trying the Belfast edition. I know it's probably just a novelty but it really does feel a lot more fun when you know the places you're buying. 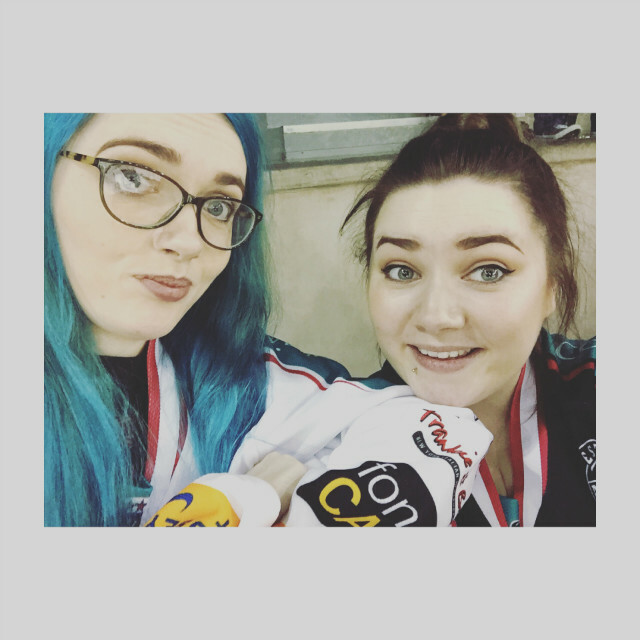 Especially when you realise you can buy your favourite ice hockey team! 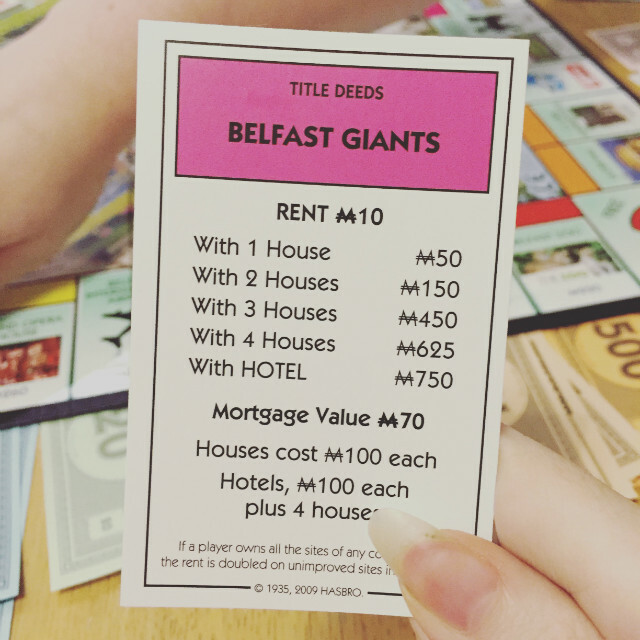 It was my mission to own the Giants, even if I didn't think it really made much sense. I mean, how can you build a house or a hotel on an ice hockey team? 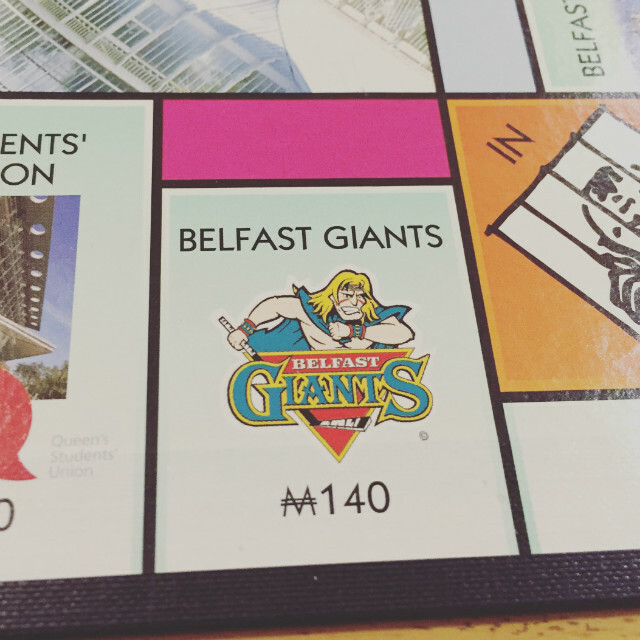 Once I had the Belfast Giants card in my hand I felt like I'd pretty much won the game. Still, we played on. It was a lot of fun. Probably the most fun I've had playing Monopoly and both Eva and aunt Karen were also enjoying themselves. They were both pretty hyper. Who says you need alcohol to ring in the new year when you can have a good old fashioned board game? We decided to play until 11pm and then pack it up to continue at another time. We put rubber hands around our money and cards and took a photo of where we were on the board. Aunt Karen wanted to head home so she could enjoy ringing in the new year in the comfort of her own house. She also wanted to drop in on my grandparents to give them some of the party food we didn't finish. As midnight approached my family and I gathered in the living room, including the dogs, and we rung in the new year like we have so many times before. My mum, my dad, Eva and I singing auld lang syne together before watching the fireworks in London on the television. After we watched some music on television and let it sink in that 2015 was over and 2016 had just started. It felt weird. I struggled to think of anything that I had done in 2015. I hoped it hadn't been as much of a waste as I felt like it had been in that moment. I felt even worse that I'd slacked off on my blog in December and I hadn't caught up for 2016 starting. At the time of writing this I've still not caught up. But once I got over the shock of being at the beginning of another year, I felt better before heading to bed. On Friday I had breakfast and my first shower of 2016. Being in 2016 was still a little surreal and I still felt bad my blog wasn't caught up but instead of doing anything remotely productive I went into town with Eva. Lets just say if I thought I would rectify the fact that I hadn't managed my money well in 2015, I was very wrong. 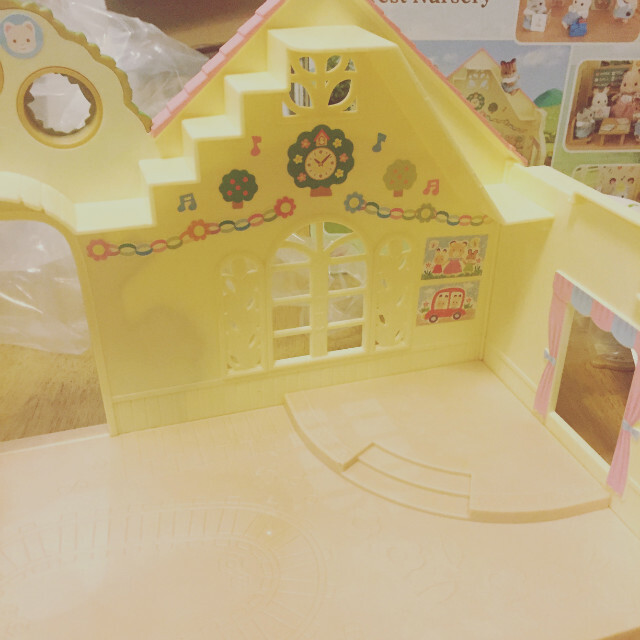 Eva and I split the cost of another Sylvanian Families set (yes, we're obsessed) and I also bought some new make up, toiletries and a new make up bag. 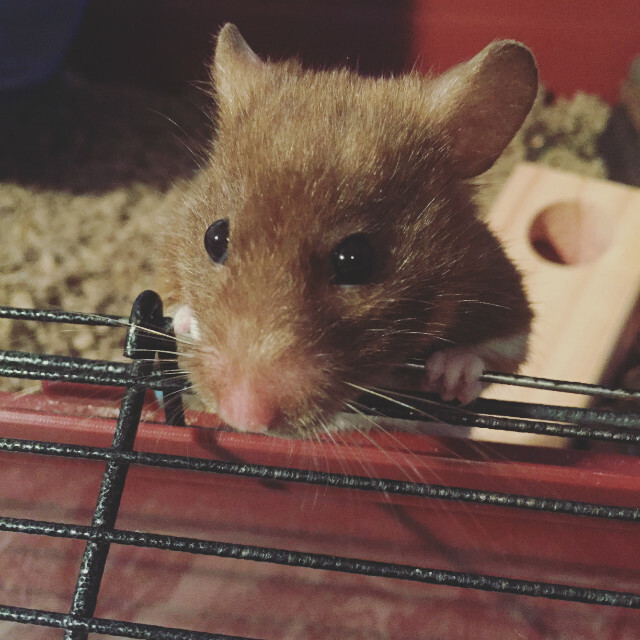 A real cute one by Zoella. On our way into town we'd gotten soaking and it was a lot colder and windier than we had anticipated so we decided to call our dad to see if he'd pick us up. It turned out my parents were going out for my mum to return some shoes so they picked us up and took us with them. Eva ended up buying new trainers while we were in the sports shop. I almost did but I felt bad enough about how frivolous I'd been already so I decided against it. Eva actually needed them, unlike me. On the way home we got McDonalds. So yeah, saving and eating better failed on day one of 2016. Oh well. 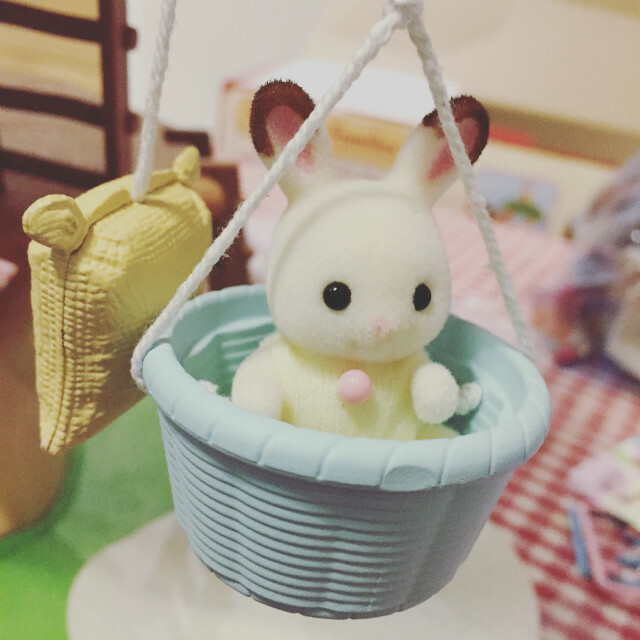 After I finished eating my McDonalds Eva and I set about setting up our Sylvanian Families nursery we bought. There was a lot of stickers to put on, which was my job, and Eva made all the little boxes and stuff. I only actually got half way through putting the stickers on and I had to stop. It's more stressful than you'd think. It's serious business! I decided to put the rest on another time as I was tired from being out longer than I had originally planned and full from my Happy Meal cheese burger. It wasn't long until I headed to bed. Dad got me up for my fry up on Saturday and we watched True Grit together as it was on television. The original. I haven't seen the new version. I really don't think anything can beat the original. Once the film was over I chilled for a bit online before getting a shower and getting ready for the game. My aunt Karen took me and it was a good game. My aunt didn't like some of the chanting going on but the most important thing was that we won. When I got home I had some supper and then headed to bed.